This little card is going to come in handy! You'll be eligible for random drawings through out the week. The more we collect, the more incentives we'll be giving you. You must be a registered consignor in order to use these. 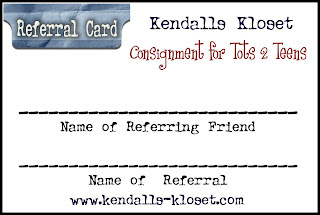 Referrals are not for shoppers but consignors. Please only give these to friends and family that are thinking of consigning. Once they register to consign, they can also print these and give them away. Her children arise and call her blessed; her husband also, and he praises her...Give her the reward she has earned and let her works bring her praise at the city gate.